Where Do All the Towels Go? 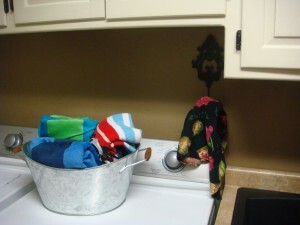 With all the swimming going on this summer, what are you doing with those beach towels being used? I finally decided to buy more than 2 towels for my 2 boys so I didn’t have to be washing and drying the towels immediately. But then I didn’t know where to store them before their next use. I also wanted my oldest to be able to reach them since it is his job to get his swimming bag together on his swimming days. 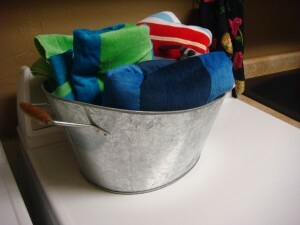 So the galvanized beverage holder/tub that I had bought back in the day when I thought I’d be having so many parties and beverages, came out of storage….and now it is filled with bright colored beach towels…ready for some wet fun! Yep, my “Happy Sink Flowers” have made a return for the season. 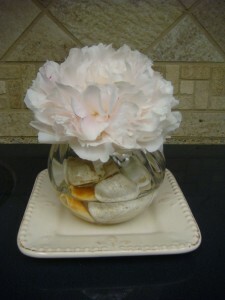 In order to spice things up a bit, I thought I’d bring my sea shell findings from a girls trip a couple years back and put them in the vase with the peonies…. Ahh, a little bit of the beach right in the middle of America. 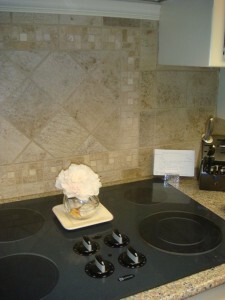 …and this time to the middle of my cooktop! Click here to send me an email.